Nancy Bruno saw a need; a need for positive, real, everyday male role models. Men who have risen above the obstacles of their lives and have become men that both they themselves and their families can be proud of. Out of this need, the Genuine Men Project was born. Her 35 subjects range in age from twelve to ninety-one years old, and each knows that life can be a struggle and it's not always easy to become the man that they want to be. These men aren't perfect; they have had their fair share of problems in their lives, but each has looked beyond these struggles and found a path that has worked for them. Sometimes, the stories seem a little vague when explaining what the men have gone through and overcome in their lives to bring them to the place where they are now. While this doesn't hinder the individual storytelling process for each subject, it does make for some of the stories seeming a little incomplete, as if we're not being given the entire story. From a design standpoint, the book is beautifully laid out with the stories flowing around Bruno's black and white photographs of her subjects. There are 2 occasions where the face of the main focus of the photo is placed across the binding, making it hard to see, but other than that, you can tell there was close attention paid to the visual look of the book. The photographs themselves are very good; they present the essence of the man and what is important in his life, be it his job, family or favorite sport. The only thing that I would have liked to have seen done differently is a little more focus on single men who are not fathers who are still positive role models. It seemed the majority of the men out of high school were fathers. I'm not saying that this is a bad thing, far from it, but I did get the feeling that the idea of fatherhood seemed a prerequisite in being considered a "genuine" man. I don't know if Bruno had this idea in mind or not, but it was something that struck my almost halfway through the book, and I couldn't shake that feeling. Overall, Genuine Men is obviously a labor of love for Nancy Bruno. She took these men and their stories to heart and presented a book that accomplishes what it set out to do: showing that everyday men from any number of walks of life can be a positive role model. 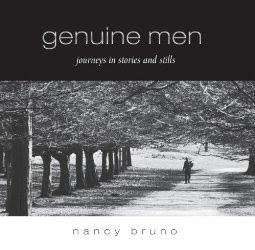 To find out more about The Genuine Men project, you can visit Nancy Bruno's website. Your comment about fatherhood interested me. Not that for a moment I disagree with your sentiment, I heartily endorse it, but it made me think about women in this situation and the fact that it's not that long since the 'idea' of womanhood was very much defined by motherhood and those of us who had decided not to, or who couldn't have children were striving for an ideal they could never hope to achieve. However, that is very definitely not the case today. It's interesting that if this is anything to go by that particular pendulum has swung over to the male side of the question. Thank you for your comment, Ann. I've been worried about my sentiment concerning fathers and fatherhood since I posted my review. I don't want it to seem like a jibe to either the author or to fathers in general. That is farthest from the case. I'm very proud of my own father and consider him a wonderful role model. It was simply something that struck out at me while I was reading this because it was also a point made in another book that I read recently; that a man can't seem whole until he has a child. I don't believe that the course of my life has put me in a position to be a father, but I don't consider myself any less a "man" as a result. Do I not want to be a father? I don't know. Unless my life changes and puts me on that course, I can't say for sure. Do I think I'd be a good father? I would tend to think so. It is an interesting question, and a valid point that you raise about how society looks at men vs women these days and how roles and views have seemed to change again.